940: Part # for 2-port AC Delco or "A.C.T.S. Ltd" vacuum bellows? Part # for 2-port AC Delco or "A.C.T.S. Ltd" vacuum bellows? It's the middle of summer here. So the interior of the 945T is more often than not reaching 45 deg C and the wife doesn't like the lack of air flow to the face when I get into boost. The problem's been traced to that twin-port vacuum bellows which operates the HVAC shutter doors. The diaphragm in it is quite cactus. No problem, I thought; order a new one. Major problem: GCP, Mother Volvo, and all the usual suspects don't have any of these listed in stock under the OE Volvo part numbers (9463042 / 9463044 / 3522945 / 3522973) or otherwise AFAIK, and neither the ACTS unit nor the AC Delco unit have any manufacturer part numbers printed on them. The single port vacuum bellows seems to be a GM / AC Delco p/n 01996701 / 15-71442, and is fitted to an s10 Chev truck - but I can't find the twin port version. So... could some kindly soul please tell me the AC Delco part number for this damned thing so I can order a new one? Or the numbers for the ACTS Ltd equivalent? Last edited by bgpzfm142; 02-26-2017 at 11:12 PM..
Shirley Surely somebody would know this? The single-port vacuum bellows in Seven and Nines can be replaced by Delco Remy part number 15-71503. This can replace Volvo OE part numbers 9463044, 3522973, etc which are now all unobtanium. The twin-port vacuum bellows is also known as Delco Remy part number 15-71438. 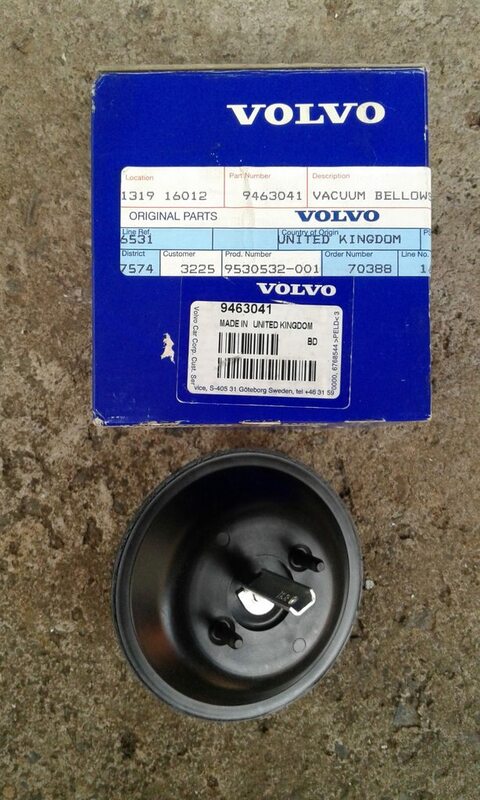 This will replace OE part number 1388206 and a number of other numerals, which Mother Volvo had once assigned to these things before making the whole bleedin' lot disappear. And it would appear that 960 ECC had the A.C.T.S. Ltd two-port diaphragm fitted to it. Who IS A.C.T.S. Ltd of the UK anyway? It doesn't appear to be Air Conditioning Tower Services. Hi, I am reviving this thread as it's the only place I have found reference to obtaining the two vacuum actuators. Thank you so much for the part numbers but I am unable to find these either (Delco Remy or AC Delco). Have you or anyone had success obtaining the Delco parts? If so from where? As the 9 and late 7 series units were built by Harrison (Div. of GM), cast your net outside of Volvodom. Knowing Generous Motors, such actuators will b common with the time period offerings of GM. At least that’s how I’m betting. Have you or anyone had success obtaining the Delco parts? If so from where? I found my replacement two-port on eBay, after much Google-fu on the part numbers. Rock Auto lists them, but they're long gone. Don't despair though - there's a NOS two port one for sale on eBay at the moment (Feb 7, 2019). Also, there's a guy in OZ who has a single port BNIB one selling for $10 AUD, which is nuthin' in real dollars, plus post to USA - which would be about $30 AUD at a guess. Or as Mr DET has said, you have to go beyond Volvo stuff. I gather there's plenty of Chev C-10s (which used 'em) in Pick 'n' Pulls and other yards there - dead Chev trucks are a bit thin on the ground over here. In that same manner of reference. Some of our members here have also spec'd out a replacement heater valve for the7/9 series in a similar manner. I think they ended up using a heater valve for an Astro van if I recall correctly. Gsellstrm has made threads about it. There were a couple of discussions about 700/900 heater valves. IIRC, when vacuum is applied in the standard setup for rapid cooling, (i.e. aircon on, and in recirculate mode) it cuts off the coolant flow completely to the heater core. Nasty! It interrupts the coolant flow at the back of the head. Not good, when the system design is based on having the heater core constantly in the cooling circuit as the default operation, and the cabin heat is regulated by the HVAC's shutter doors, not the flow of coolant to the core. Especially not good with turbos in this land, where ambient temps are often quite high. gsellstr did indeed come up with a better solution than factory. With vacuum applied on a four port valve, the heater core is bypassed, but there is coolant flow via the tap. This was his thread. On this side of the pond however, using a Gates HV5631 tap (to fit a V6 Commodore) might be an easier-to-get-cheaply part in OZ than the NAPA 660-1357, which gsellstr used.